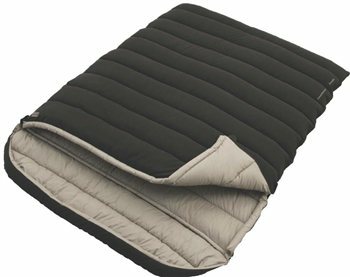 Constellation is our new top sleeping bag range with superb quality, inspired features, Outstanding fabrics and performance fill. A wonderfully comfortable bag. It has plenty of space and feels more like sleeping under a duvet, and despite the large opening somehow manages to keep the draughts out. Bulky when packed, so not for hiking, but that's really the only caveat. We use it with a Outwell Dreamboat 12cm Double mat, and with some ordinary pillows you might as well be in a proper bed. It does everything with quality. Either 2 singles, Large double or two duvets. Lovely and snug, we use it as a double and their is lots of room. Its cold and draughty in our old campervan but we where toasty warm in this bag. Fits in our locker above the cab with no problem. Delivered single rather than the double we ordered which was very disappointing. However customer helpline could not have been more helpful or efficient in sorting this out, arranging collection and delivering correct order promptly. Used this for camping at a festival which turned out to be very wet and chilly. Kept us warm and comfy - worth every penny.